A couple of weeks ago, I proposed a “Golden Rule of Fiscal Policy” that was probably a bit too wordy. Good fiscal policy exists when the private sector grows faster than the public sector, while fiscal ruin is inevitable if government spending grows faster than the productive part of the economy. In some recent speeches, I’ve been experimenting with how to discuss this concept, and I’ve decided to be more concise. I’ve also decided to be self-aggrandizing and call this Mitchell’s Golden Rule. In some sense, this Golden Rule is a way of trying to help people understand why it is important to limit the growth of federal spending. And based on my recent speeches, it appears that linking government growth and private sector growth is very helpful. Especially when I point out that the fiscal crises in nations such as Greece are the result of the opposite approach – letting the public sector grow faster than the productive sector of the economy. Another advantage of the Golden Rule is that it doesn’t matter whether a nation has a budget deficit or a budget surplus. As I’ve explained on several occasions, the fiscal problem in most nations is that government is too big. Deficits and debt are just a symptom of that problem. Following the Golden Rule doesn’t prohibit tax increases, but it certainly means they will be far less likely. Simply stated, tax revenues tend to track economic performance. So if the private sector is growing faster than the government, that means tax revenues will be growing faster than government spending. So why raise tax rates? P.S. Regular readers know that I’ve already tried to create a legacy with the not-so-famous Mitchell’s Law, which points out that politicians often propose to expand government to ostensibly solve the messes created by previous expansions of government. But there’s nothing new about Mitchell’s Law. Great economists such as Mises wrote about how one misguided government intervention often becomes the excuse for another foolish government intervention. I simply coined a phrase in hopes of helping to popularize the notion that one government mistake is often a precursor for another government mistake. 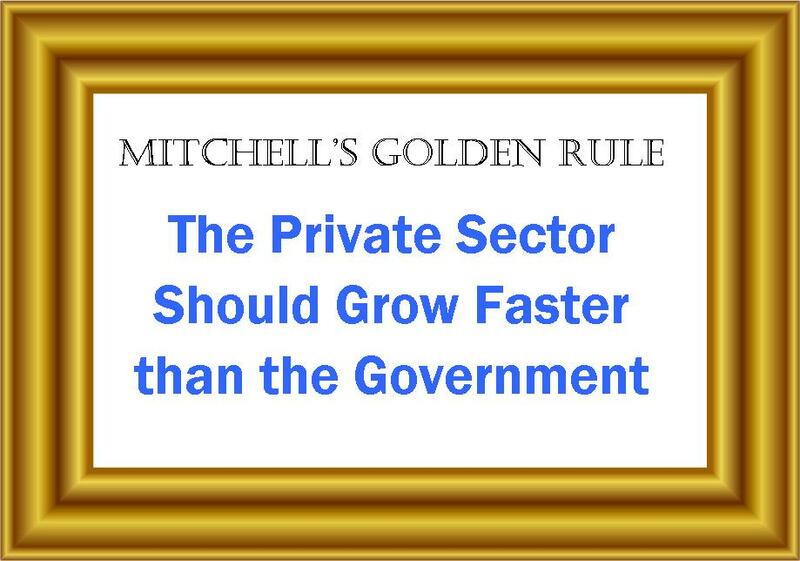 I’m not aware, however, of anybody that has stated that the key to good fiscal policy is restraining government spending so it grows slower than the private sector. Hence, my narcissistic decision to label this concept Mitchell’s Golden Rule.